The role of a company is to offer customers a set of technologies enabling them to perform certain behaviors with a desired outcome. In order to be inspired or learn you are now reading this article, I have also published it as a presentation in slideshare.net and present these insights as talks, workshops, toolboxes or master classes. All different technologies at my disposal to aid people in assisting their desired outcome. Two things are happening: Slow social change has transformed customer demand (outcomes). And exponential technological change is developing new habits and behaviors which needs to be accommodated by new technologies. QUESTION: Are our current technologies limiting our outcome creation through a definite number of behaviors – can we accommodate or create new behaviors. Subtitle: do we need new technologies to accommodate present and future economies? In Business Strategy every company is the sum or average of a set of components, linked together in a value chain. Competitive advantage is gained through increased optimization in one or more parts. Digital breaks up these homogenous value chains by essentially making parts worthless, adding new components or removing old. 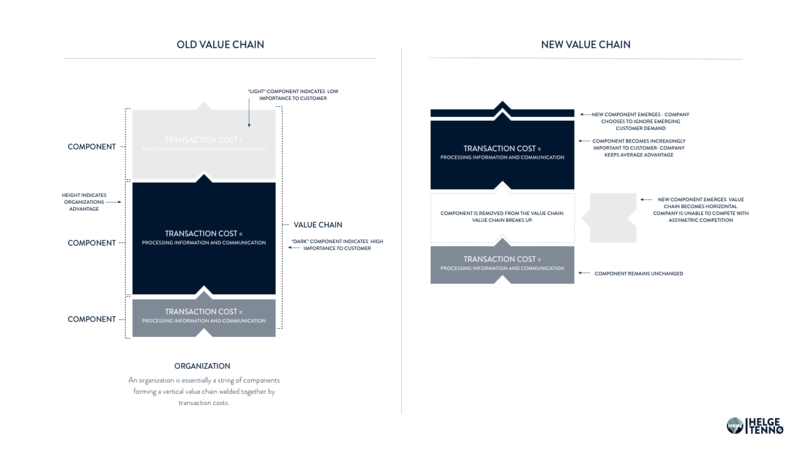 Example: Sales and distribution were two of the most important parts in the encyclopedia business value chain. Then came the Internet and the product was given away for free online. The industry couldn’t compete because the Internet made it’s two most important components (sales and distribution) obsolete. QUESTION: Which component(s) of our value chain has or is close to detach, switch or weaken? Successful innovators care about solving interesting problems, fueled by a deeper understanding of and insight into human motives. In other words: Companies need to organize themselves around their customers – not their products. Which is difficult because decades of management capitalism has thought us to organize our companies, through layers of management, away from the customer. The product oriented approach makes it difficult for companies to see the world from the customer perspective and companies proceed to make investments in their core business and core technology. Missing out on new offerings, economies and revenue streams. 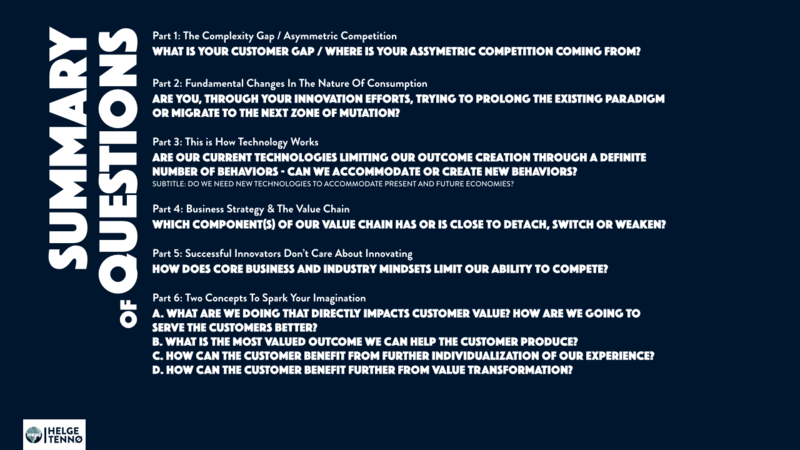 QUESTION: How does core business and industry mindsets limit our ability to compete? The Internet introduces a new set of mechanics to fit with customers emerging habits, behaviors and demands. The Concentrated Model & The Hidden Space – companies tend to limit their imagination to the same space they operated in before digital. Meaning that they limit their opportunities both when it comes to what to sell, reach of market and how to sell it (where to find new revenue streams). Example: If you are running a coffee shop, are you limiting your income only to selling coffee inside its four walls? Or are you letting customers subscribe to your experience, through home delivery of coffee beans and grinds? Active Or Passive – traditionally companies have been passive. Interacting with customers only when they reach out and hire the product. But, companies need to rethink their value creation; how can we help our customers capture more value through collaborating with us every day? Example: Fertilizer company Monsanto collaborates with farmers every day – through software and sensors in the fields and on farming equipment. Helping farmers know how much, what, where and when to fertilize. Competitor Yara is getting sidelined, choosing to stick with the old model and old infrastructure of delivering sacks of fertilizer on the back of a truck every month or less. Content Is The Product – companies tend to think of themselves in terms of their products and see interactions with the customer as a cost, a marketing objective. “But, the answer to questions like ‘Why do customers buy from us?’ don’t reside in products. They reside almost entirely in the interactions that take place in the marketplace.” – Steve Denning. Companies’ need to see themselves as the sum of their customer interactions and invest in them as a part of their core deliverable. a. What are we doing that directly impacts customer value? How are we going to serve the customers better? b. What is the most value outcome we can help the customer produce? c. How can the customer benefit from further individualization of our experience? d. How can the customer benefit from further value transformation? Technology will disrupt. The one about the Why, the what and the how | Designing: service, customer services, customer experience.